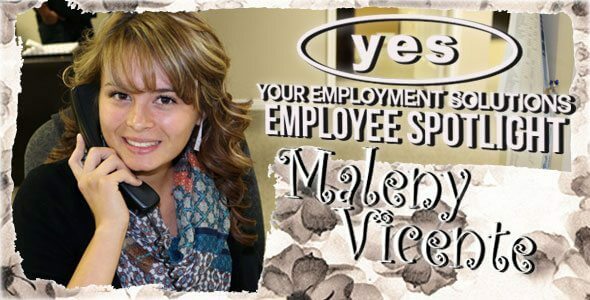 This month's Employee Spotlight belongs to the Director of First Impressions in our North Salt Lake office, Maleny Vicente! Maleny has been with YES for nearly two years and has done a phenomenal job at welcoming our guests, attending to their needs, and directing them to the appropriate people and places in such a kind, friendly manner. We have received countless compliments on Maleny and her work and are undoubtedly grateful to have such an amazing person be the face of our corporate office. Sleeping, watching movies, spending time with my husband, eating (ANYTHING spicy), fishing or anything outdoors. Impatient people, bugs especially mosquitos, getting sick. Oooo, if we had a chocolate fountain so I could eat chocolate covered strawberries all day! William Levy, because he's good looking. Any where outdoors camping with my husband! Roasting marshmallows… yummm! 7. Rumor has it you like to bake. What’s your favorite thing you’ve ever made? Trying not forget things when it gets super busy. I try to put sticky notes on my screen to remind me so I don't forget. It's the best place to get a job. If you're looking for work come here and we will find you a job fast where you will be happy. 11. You challenge the president of YES Reed Laws and the vice president Kerry Westenskow to a spicy chili pepper eating contest. What chili do they have to eat? Who would win and why? I would give them a habanero pepper so I could watch them cry and gasp for water. But I can see Reed winning because he looks like he can handle a bit more and plus I never see Kerry eat anything spicy, so I'm guessing he won't be able to handle it. Maleny, you are the best! Thank you for all that you do to make Your Employment Solutions the best staffing agency in Utah!